Caregivers and Parents agree that TubieGuard is the best tube feeding accessory available today. There is nothing on the market that improves the enteral tube feeding experience like TubieGuard. Before the TubieGuard device was invented, feeding tube connectors could easily be separated. In very young children especially, a stray kick or change in position threatens the integrity of tubes at the point they connect. Tube separation, tube leakage, tube tampering and accidental leakage are eliminated with TubieGuard. The TubieGuard is a plastic case that snaps closed around feeding tube connectors. We believe this is a revolutionary development to improve the integrity of feeding tube connections. A secured connection is leakproof, the patient receives the prescribed feeding solution, and there is a reduced risk of tampering. The TubieGuard experience prevents spills, accidental tube separation and waste. Caregivers agree that accidental separation of feeding tube connectors is wasteful, messy, and compromises patient nutrition. The TubieGuard makes enteral feeding a better, more reliable and more secure experience for kids. 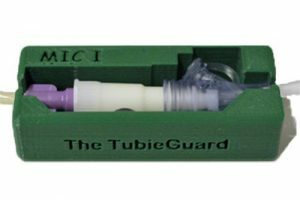 The TubieGuard will accommodate all brands and styles of enteral tube feeding connectors and is available in three colors. Liquid enteral nutrition is carefully calculated for every meal, and maintaining feeding tube integrity is important. The TubieGuard is truly taking the worry out of tube feeding for kids. Tube feeding is done in the home, in hospitals, in nursing facilities and other institutions. A patient’s treatment experience will be enhanced significantly using The TubieGuard in General Hospitals, Skilled Nursing Care Facilities, and Rehabilitation Centers. Care providers and administrators may email or call (781) 264-0229 for institutional pricing and ordering. A TubieGuard product specialist will contact you immediately.